If you like a clean house but don’t like doing the work yourself, then it would seem obvious to get a device that will do the cleaning for you. There are a myriad of things that will vacuum, wash windows and more, but how well they do their job varies greatly from product to product. The Roomba is well-known at this point, but not everyone wants to shell out for the real deal. If you want a little vacuum to deal with the dirt but don’t want to pay hundreds of dollars, then this Mopet Microfiber Vacuum could help. This can work for 6 hours non-stop on 3 AA batteries, or you can set it for a ten minute timer to deal with little messes. This is likely only going to work on hardwood or very short carpet though, as it would easily get caught and only vacuum one place. The fluffy pad at the bottom is going to be a magnet for dust, so it comes with a brush to remove extra hair or fluff. 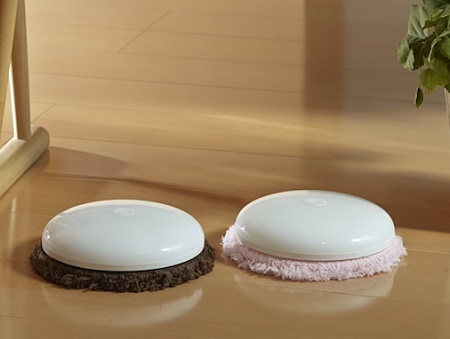 As the microfiber pad is bound to fade from its brown or pink color, it can be removed and washed. It’s made of polyester, and comes with an aroma tray, pad, cover, and stickers to make it look cuter. This is going to cost you $83, and will likely only be useful in houses that don’t need much help with cleaning in the first place.